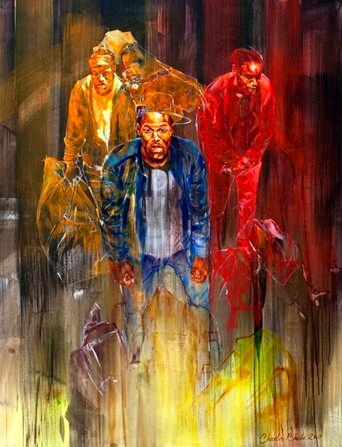 Contemporary African Art, Issue #001 -- Welcome to our first newsletter! Looking for a stream of current news all about Africa’s contemporary art world? Then this is the place where you will find it. Every 2 weeks I will be sending you snippets of info about what’s happening on and off the continent, directly involving you in the exciting world of contemporary African art. It may be news about emerging artists, which art fair or auction is on the horizon or which new exhibition by Africa’s established artists is due to show. It could be words from a curator or an editor with something to say…. or it could just simply be about capturing artisans going about their daily work or what’s happening on the street. All of it to show that African art is hugely dynamic and quite literally unable to be categorized, compartmentalized or easily defined. I know it may seem crazy to take the continent as a whole and put it under the gigantic umbrella of Contemporary African Art but - if you feel the same as I do – that together the combined strength of artistic statement by this continent’s artists will serve to drive it to where it needs to be - then read on and sign up! It’s important to me to be able to use this publication to showcase emerging artists from all the various countries of Africa, many of them whom have limited funds and limited exposure. 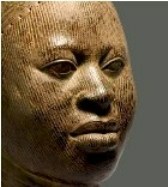 So you will always find news of some glimmering, rising stars along with the Sirius stars of the African art world. Recently I attended an art fair in the capital city of Zimbabwe, Harare. It was an outside event occasioned this year by a gentle winter sun where a large, enthusiastic crowd was treated to a display of contemporary art from a wide spectrum of practicing artists. ‘Wild Geese’ Art Festival is steadily growing in stature and currently attracts over 150 artists from around the country. Included was a timed event (15mins) to which a ring of 16 artists using an identical, limited, palette blasted out an image from the 2 given topics “Seasons” or “Amazing’ on to their square canvases. Ever-crescending music heightened the occasion giving impetus to the artists to finish in time. I loved it! In the next issue I will feature a number of the artists I met on that day including David Chinyama whose work is shown above. Africa seems to be having a challenging time becoming part of the world art arena. The openings of the Venice Biennale 2017 and Art Basel, Basel 2017 have just passed in May and June. While the galleries and artists that were represented did their countries and themselves proud there is still strong evidence to support the fact that Governments and State Departments have a long way to go in promoting the Visual Arts agenda of their countries. They desperately need to get behind it with financial and cultural support at every level; from schools, college and other teaching institutions, to national and private galleries, art shows and fairs. Grants, loans, residencies could be made available and public art prizes introduced. Unless this happens for a sustained period of time it will continue to be a struggle to showcase the formidable and exciting talent that exists on this continent… and… ultimately, for artists to be able to make a decent living. 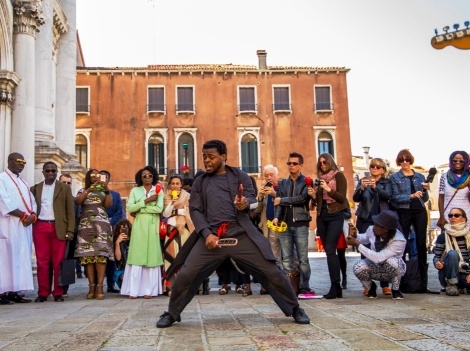 It is 20 years since Africa was given a pavilion at the Biennale in Venice and in 2017, only 8 countries out of the 54 that make up the African continent were represented this year at the Biennale in Venice. These were Angola, Egypt, Ivory Coast, Kenya, Nigeria, South Africa, Tunisia and Zimbabwe. And Bravo Kenya for getting themselves to Venice when promised funding never came through! There were some artists from Africa who showed their work on the International Exhibition made up of Diaspora artists and titled ‘Viva Arte Viva’. Included were Nigerian sculptor and performer Jelili Atiku, South African Mohau Modisakeng and Malian, Abdoulaye Konate. 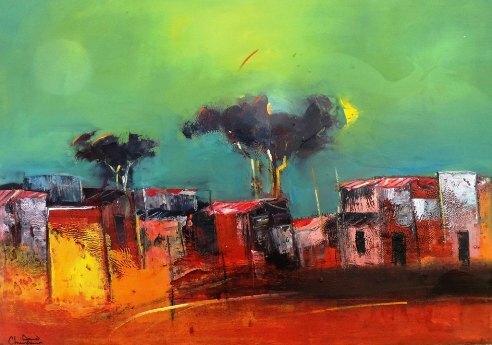 Konate’s work here is titled ‘Bresil’ and reflects his time spent with the Guirani Indians in the Amazon. He draws parallels of their plight to some of his own displaced people. Performance art certainly enlivened the experience for Biennale visitors. It created a sense of ceremony and helped non-African audiences to comprehend that there is something more complex to the African narrative than they had ever imagined. Nigerian artist and choreographer Qudus Onikeku said in the catalogue for his stand “My role as a dancer is to not only look for ways to go through my own journey, but also to trigger the body memory of my audience”. By activating the body through dance, the artist seeks to escape the burdens of history—and heal them. The Nigerian stand also included a newly developed installation called ‘A Biography of the Forgotten’ which featured small hanging bronze sculptures alluding to Benin artworks that were plundered by the British in the late 19th Century. Away from this stand and at another expansive and hugely expensive installation, a furore built up around Damien Hirst’s ‘Treasures from the Wreck of the Unbelievable”. 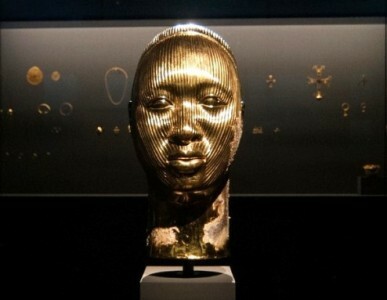 Included in his underwater fantasy was ‘Golden Head’ (Female) a sculpture resembling the celebrated heads of Ife excavated in 1938. Some stayed in Nigeria but some were smuggled out to England and Europe. 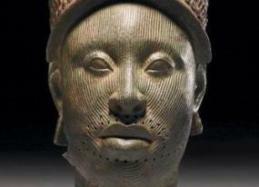 While some Nigerian patriots are outraged at what they see as both plagiarism and cheapening of such a magnificent National heritage treasure, I believe the controversy will bring much needed awareness to both the beauty and the plight of some of the original sculptures which are currently located away from their home base. Goodman Gallery from SA showed works by Misheck Masamvu, Kudzanai Chiurai, Tracey Rose, Kendell Geers, Gerhard Marx, Sue Williamson, Ghada Amer, William Kentridge, Alfredo Jaar and David Goldblatt, Candice Breitz and including a young bright star, Nolan Oswald Dennis. 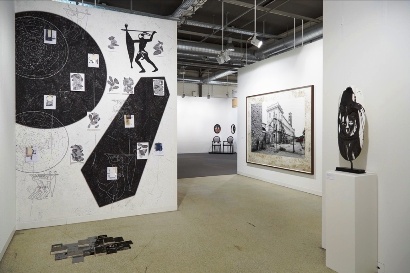 Exhibiting in the Galleries sector of Art Basel for the first time, Stevenson Gallery, SA presented new and significant historical works by Robin Rhode, Zanele Muholi, Meschac Gaba, Nicholas Hlobo, Pieter Hugo, Meleko Mokgosi, Serge Alain Nitegeka, Viviane Sassen, Moshekwa Langa, Barthélémy Toguo and Kemang Wa Lehulere amongst others. A very exciting new contemporary art gallery celebrated its opening in March 2016 in Accra, Ghana. Named for the year the African country declared independence from the United Kingdom, Gallery 1957 was inaugurated with a forward-looking mission to support the local contemporary art scene and established and emerging Ghanaian artists. Their opening night featured a leading Ghanain artist, Serge Attukwei Clottey whose works appear above. His solo exhibition “My Mother’s Wardrobe” explored issues of politics, culture and the environment through the use of everyday objects such as textiles and bright yellow plastic gallon containers.... Stimulating work and an exciting venture for Accra. Other than the previously mentioned Future Generation Art Prize, 2 notable achievements are: The noted curator and artist, Olu Oguibe has been awarded The Arnold-Bode Prize, 2017. 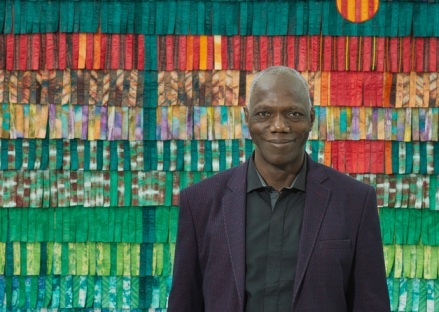 Born in 1964 in Nigeria, he has been working for almost 4 decades as a conceptual artist and thinker dealing with social issues and particularly the very topical ones of flight and migration. The Angolan artist, Kiluanji Kia Henda, was awarded the Frieze Artist Award , 2017. Born in 1979 he currently lives in Luanda and works across photography, video and performance art. A fair with a difference showcasing affordable work by high calibre artists with original prints ranging between R2800 and R5000 in price. 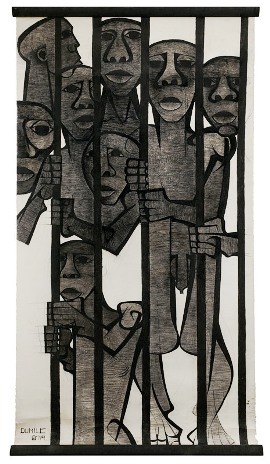 One of my all-time favourite African artists Dumile Feni is up for sale on the upcoming auction. That's all for this time, hope you have enjoyed Contemporary African art's 1st Newsletter!